I shall return to my studio forthwith, but first, let me take a selfie. There’s absolutely zero balance because selling yourself is a full time job and if you put enough effort into the process to make a difference, you’re left without time or creative energy to achieve your primary objective. Or maybe I just spend too much time on the Internet. I can’t dispute the fact that I’m getting more traffic than ever, mostly from Reddit (but obviously getting Reddit traffic boosts your reputation with Facebook and Google) but I’m spending less and less time producing content…ah…I mean, making art. Dragon Comics are great but they don’t really move me forward from a creative standpoint. They’re more of a standby. Well, tomorrow I’ll start on my Halloween bulletin board. That should cheer me up and possibly even inspire me. Plus, high quality content. I also have to turn in a listicle and 11 book reviews by tomorrow night. I’m sure I’ll have time to accomplish all of that in between making lunch for The Man and hanging out with the Misseses Kitty. 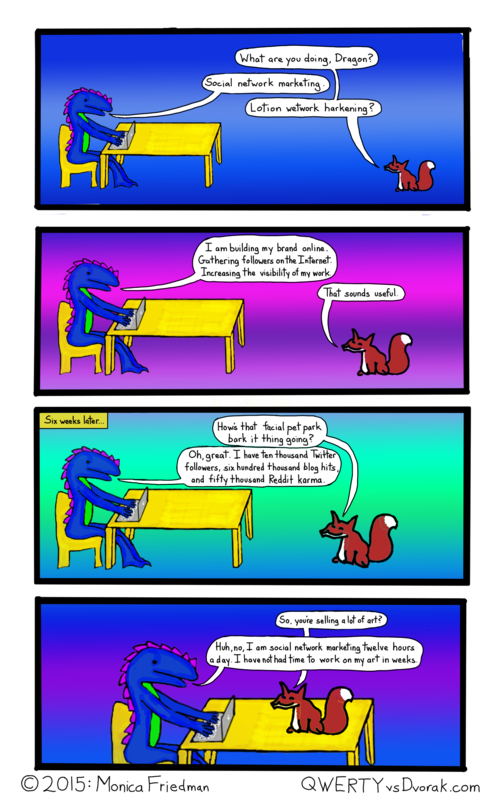 This entry was posted in dragon comics and tagged balance, building your brand, comic, dragon, marketing, plans, social network marketing, time on September 29, 2015 by littledragonblue. Art supplies are expensive. Found objects are not. Owning a flatbed scanner and having the ability to make convenient facsimiles of 2-dimensional drawings is great, but admittedly, I find the actual act of scanning pages so annoying that tonight I spent and hour constructing a mandala out of rose petals, almonds, glass stones, the spent casings from a nail gun, and plastic Buddha-shaped toothpicks instead of 2 minutes scanning an old design. My object choices please me. I considered other object, like pennies, quarters, screws, nails (we are doing some work on the front hall), spent glow bracelets, silverware, and cashews, but this feels right. The little rainbow heart in the bottom right is something I made in my Trickster’s Hat period, out of leftover bits of construction paper from a bulletin board. I thought if I started doing more of these, making them more complex, that could be like a signature. 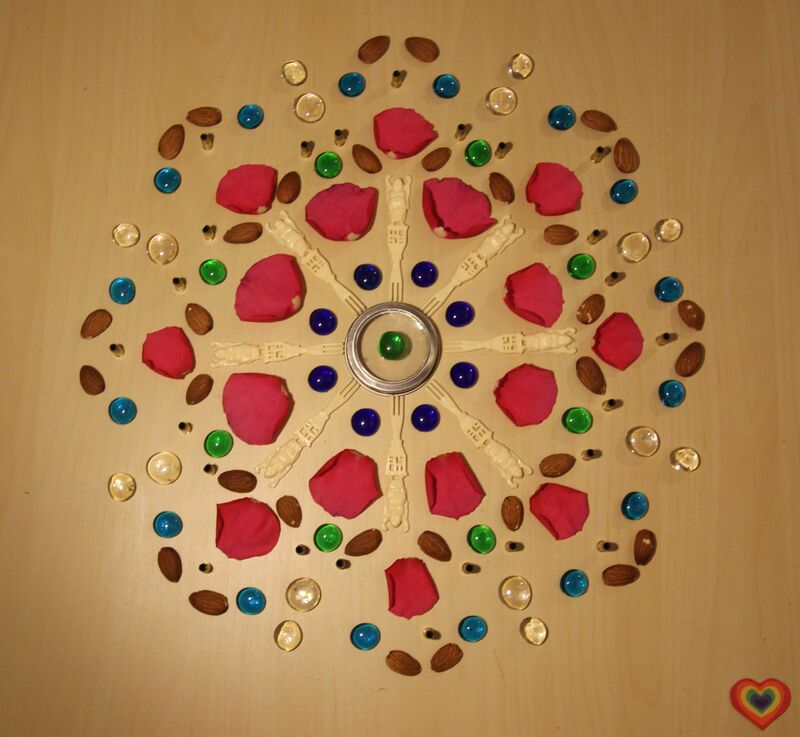 I also thought that what I really want to do a 3-d mandala out of is M&Ms. Well, the Candy Year* is about to begin, so it could happen. The first cold of autumns appears to be upon, which is wholly unfair, considering it was 95 degrees today. I am not one of those white girl who pumpkin spices everything and loves autumn (regular readers of this blog know I am, in fact, a blue dragon). I freaking *hate* autumn. The changing of the seasons from summer to not-summer depresses me. Cold weather bothers my body and disturbs my spirit. The only thing that I want pumpkin spiced is pumpkin pie, and I only want maybe 1-2 slices of that in October and then however much pie I can eat Thanksgiving weekend. Anyway, I’m sneezing all over the place and really unfocused. Boo. Today I wrote a rough draft of an article entitled “Powerful Women of Webcomics,” 9 book reviews, and copy for The Man’s new business website, but it doesn’t feel as if I accomplished much. My only other daily accomplishments were taking a 2-mile walk and cooking a delicious dinner of gluten free macaroni and cheese, shrimp scampi, and mushroom and spinach pakoras, all from scratch, obviously. I am not so far gone as to consider making a box of Kraft dinner a daily accomplishment. I have some more writing to do, and then I will be taking this Nyquil and, if the heavens smile upon me, passing out. *The Candy Year refers to the period from mid-October to the end of April when people, regularly, every other month, keep giving you treats: as soon as Halloween decoration are up, it begins, with little miniatures and Hershey’s Kisses everywhere; no sooner have you consumed your Halloween candy then you are called upon to help finish up this Thanksgiving pie; the pie being digested, out come the chocolate Santas, Christmas cookies, bouche Noels, and fruitcakes; all this is cleaned up over New Years, and then everyone makes New Year’s resolutions to stay off the sweet stuff until Valentine’s Day rolls around, when you’re offered fancy chocolates and terribly candy hearts; which you still have when you’re suddenly confronted with all those jelly beans and creme eggs in your Easter basket. The candy year ends when people suddenly start considering their summer plans and thinking that they might want to put on a bathing suit again. This entry was posted in 3D, mandala and tagged 3d, mandala on September 28, 2015 by littledragonblue. 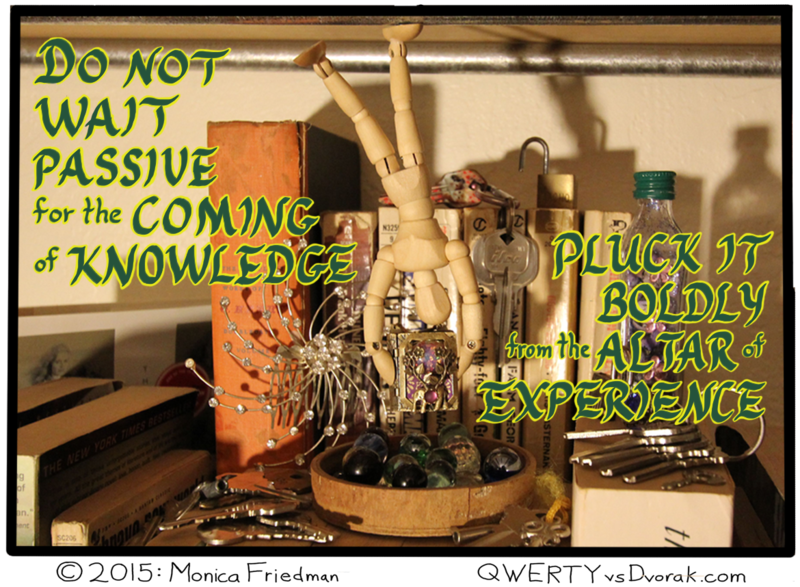 This is my little motivational poster from yesterday when experience kicked me in the head. The really sad part is that the knowledge I took away was something I’ve always known and only periodically forget, which is to save your work, you fool. In my defense, that’s what I was trying to do when everything crashed. This version is pretty cool, but the initial D in the original was so much more elegant. That lettering took about 90 minutes, which seems excessive. Why don’t I improve at calligraphy, something I’ve practiced all my life. Constructing the altar of experience was a lot of fun. That little artist’s model really isn’t good for much; his legs are different lengths and his his joints don’t move very far and he’s actually not capable of assuming many natural poses. However, he does have magnets in the little wedges that serve as his hands and feet, which has possibilities. I considered a few items he could be holding in a 3D comic before I gave him the book and let him hang upside down. He could hold, for example, a tiny metal sword and shield. The idea for the text came after the visual concept, which never happens with comics, but sometimes does for bulletin boards. Still have a couple comic ideas kicking around, but this stiff-limbed little wooden fellow has some possibilities. Got a few things in the works. This entry was posted in 3D and tagged 3d, advice, life, motivational, photography, photoshop on September 25, 2015 by littledragonblue. Even thought I started today’s post earlier than usual, I experienced greater than usual adversity, including a weird glitch in Photoshop that erased all the vertical images. I spent a long time repairing the database and rebuilding the thumbnails, which resulted in the return of a bunch of photos that disappeared last October, but did not fix my original issue uploading portrait oriented imaged. I settled for a landscape picture and tinkered with hand written text for a while before my everything crashed and I lost all my work. Meanwhile, my Internet is finking out so hard; pages are taking minutes to load and everything seems fubared and hopeless. So I give up for tonight, at least on this project. 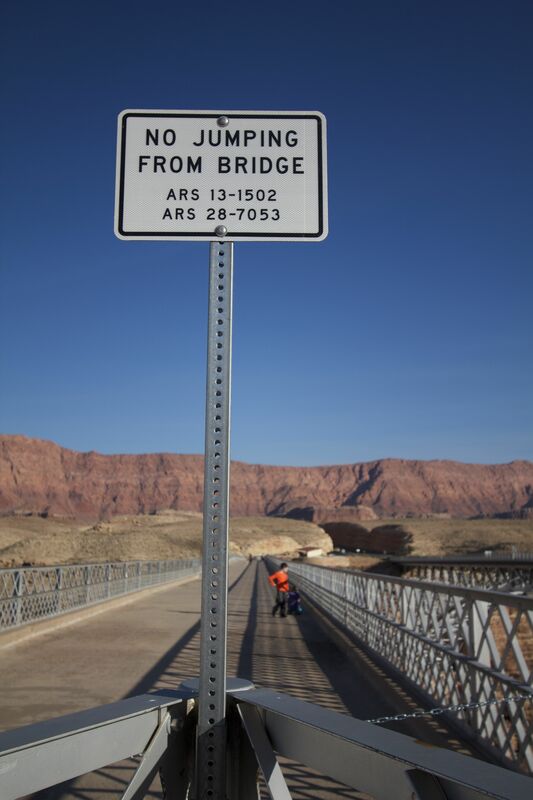 Instead, please enjoy this recently returned image of the Colorado River along with some much appreciated words of wisdom. 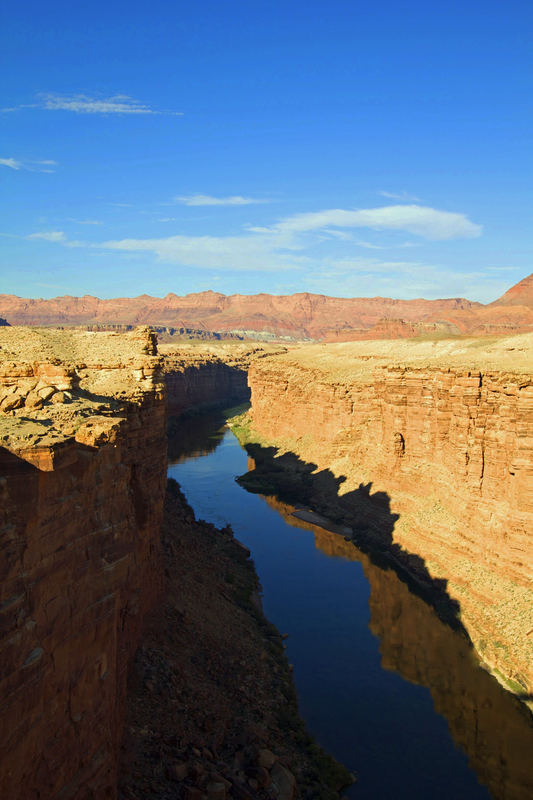 Shot from the Navajo Bridge. We also saw 2 California condors at this site. This is really useful advice right about now. ETA: my Internet is so wrecked that it took 20 minutes to upload these photos. I really hope you enjoy them. This entry was posted in photgraphy and tagged fail, images, news, photoshop, problems, update on September 24, 2015 by littledragonblue. Usually the words come before the images, and this comic was no different. 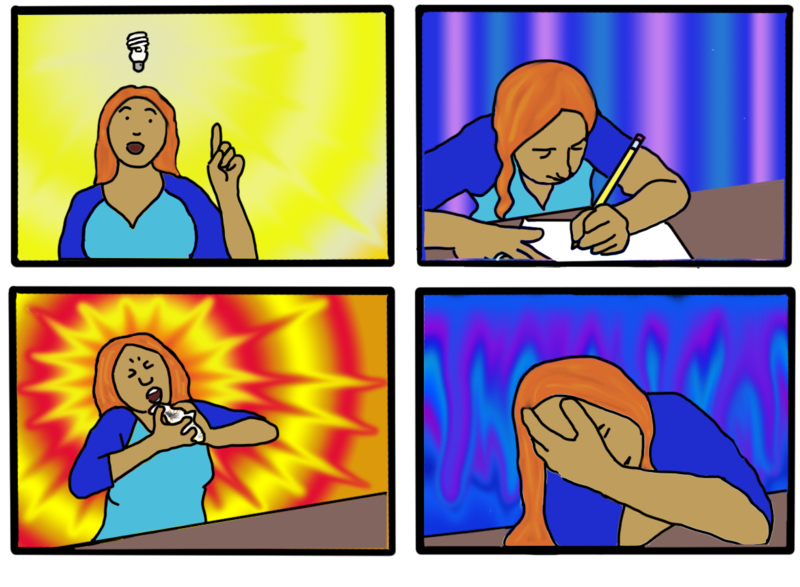 When I start drawing, sometimes I put the words into the file first, just so I could see how much space they would take up, but for this comic, there weren’t that many words, and I was feeling very out of sorts, so I wanted to get the more complicated part out of the way before I lost my eye hand coordination and ability to focus. So, I saved the dialog for later, and once I had the black and white outlines I started to wonder if it could be equally, or possibly even more entertaining, as a silent comic. Yeah, neither of them are as entertaining as the actual idea I really couldn’t draw because I was too tired to even imagine Legolas as a rhinoceros (OK, no, that wasn’t the gag, but it’s a similar type of a problem) but this is the thing I created today. At least I received both a request to reprint my article about refugees and comic (my 2nd reprint request this year) plus I found out that I have been put on the media list for Tucson Comicon. Finally! I will fulfill a lifelong dream: employing a press pass to get into an event I want to attend without paying for a ticket. Whee! My writing is really paying off. Also, I’m going to Comicon. 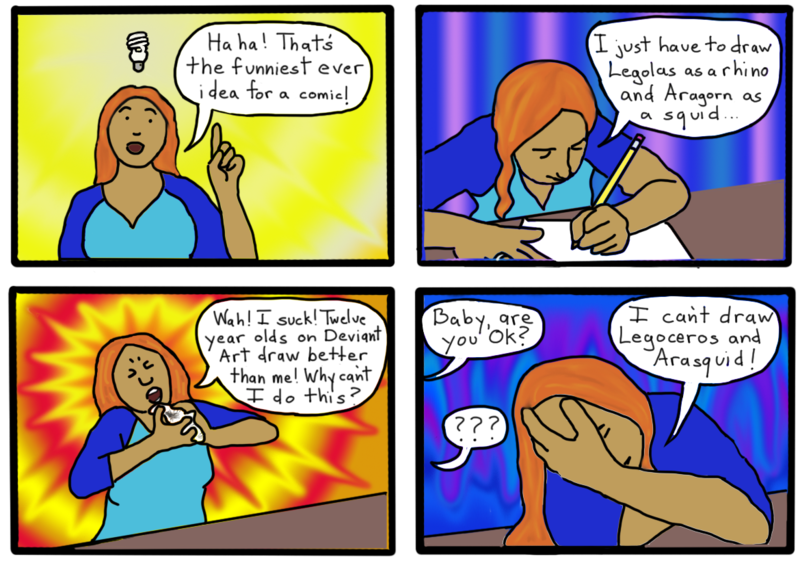 This entry was posted in webcomic and tagged comic, drawing, fail, frustration, webcomic, writing on September 23, 2015 by littledragonblue. Those of us who have never felt quite human can only utilize the great social equalizing power of the Internet to a certain degree. 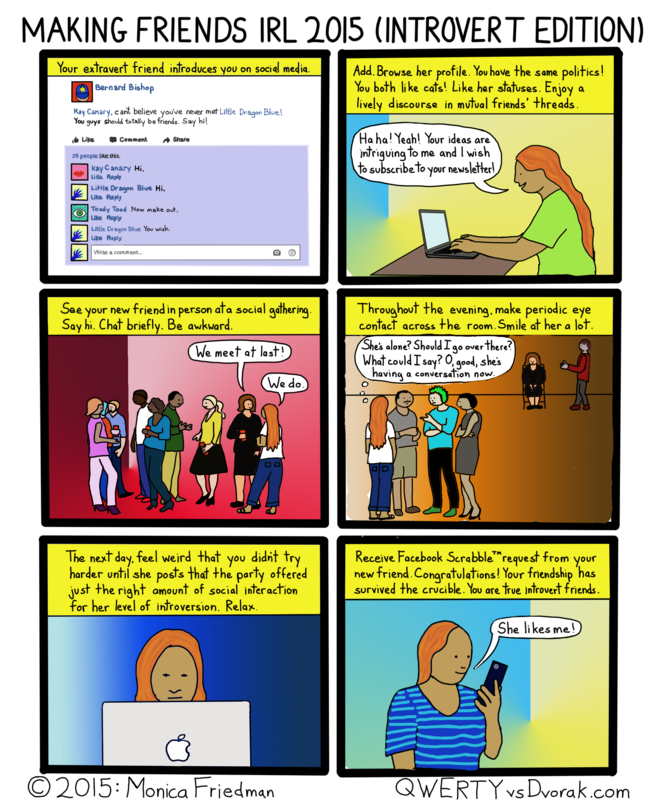 After a while, you have to venture out into the world of realtime flesh interaction, where, if you screw up, you can’t just delete your profile and start over. If you’re fairly young, maybe you can move to another city and try again, but after a certain age, you probably own too much stuff, including real property, to make that a feasible option, and you must, instead learn how to pass yourself off as a normal person who can periodically attend crowded events and make conversation with unfamiliar people. I would not attend as many parties if not for The Man, so I usually have the option of hiding behind him, although I sense that he would prefer not to have to drag his wife around like a leaden shadow when he wants to socialize (which is all the time). Other strategies include offering to help the host/hostess with their duties, scrupulously reading the titles of all the books on the shelf, and making friends with the household pets. Or, you could just be a bit more aware and a little more confident. If you have access to someone’s social media profile, you could browse it in advance in order to prepare yourself with topics of mutual interest. Or, you could simply be well-informed or opinionated, which will also give you many things to talk about. Just remember, no one else can see inside your head. If you sound confident, everyone is going to perceive you as such. If you act like you’re OK, the world will respond as if that’s the case. 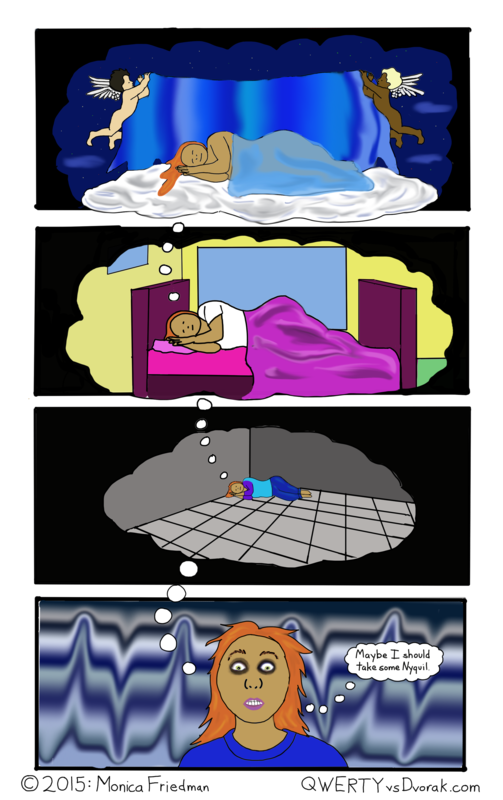 This entry was posted in webcomic and tagged friends, funny, introversion, introverts, making friends, parties, webomic on September 22, 2015 by littledragonblue.